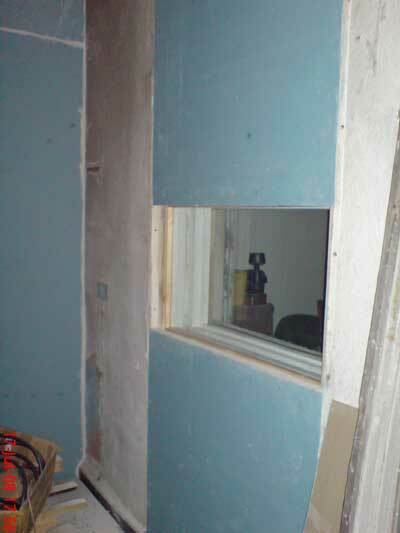 Next, we set upon filling in the opening in the load-bearing wall ajoining the studio with the control room. I decided to install glazing in this opening rather than using a video camera setup like some studios. This presents it’s own problems in that glazing is less of a sound insulator than a solid wall. I therefore used two uncoupled walls, each with its own glazing. There are 3 layers of acoustic plasterboard on each side with “Green Glue” between each layer as with the rest of the construction. The cavities within each wall is filled with rockwool and there is an airspace of about 4″ between the two walls. A local glazier was called in to fit the glass, which was sealed all around each pane with silicon sealant. He kindly gave the inside a coat of paint for me as I wouldn’t be able to get to it later. 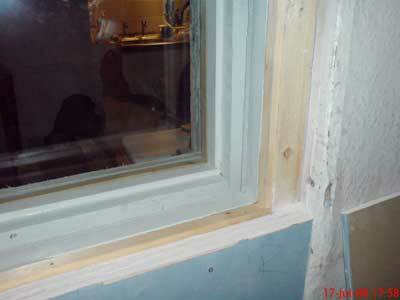 The old double-glazed window will be used in the wall of the “inner-room”. Here, you see the construction before I set to it with a pot of paint!